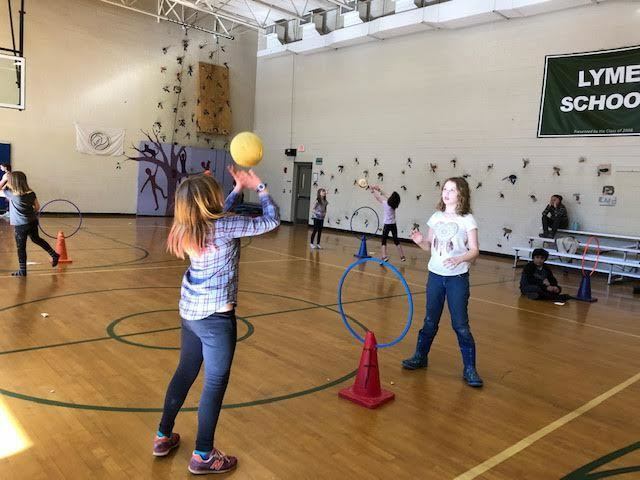 This week in PE, the fourth graders paired up to work in a multi-faceted activity combining eye-hand coordination, setting in volleyball, and working with a partner, all domains of learning (psychomotor and affective). Students practiced the skill of setting using a foam ball with the goal of using two hands and setting the ball back and forth over a cone with a hula hoop as visual target. Students had to keep track of the number of times they were successful in keeping the ball volleyed over the hoop. Working with a partner on a specific skill is a good way to help students receive productive feedback from one another as they work toward success.